In Tamil and perhaps in some other languages too – entry is often described as ‘jump’ – especially when it comes to politics …. ‘jumped into politics’. Again in Tamilnadu (and perhaps across the Nation) politicians have monikers (adaimozhi) and titles – often conferring heroism – we have ‘anja nenjan’ (one who fears none); Maaveeran (great warrior)….. those who have no scent of a battle front are also conferred titles portraying valour and fighting skills ! To fill the legacy is certainly difficult and that is done by a person who has won gallantry award – a teacher, having received awards on that front too. It is a woman – Smt. Anandiben Patel, who was only woman leader accompanying the then BJP President Murli Manohar Joshi in unfurling the tricolour at Lal Chowk in Srinagar in 1992 and was elected as a Rajya Sabha MP two years later. Anandiben Patel is the new CM who takes over the reins of Gujarat as its first woman Chief Minister, succeeding Narendra Modi. Governor Kamla Beniwal administered the oath of office and secrecy to Patel, 73, who will be heading a 21-member ministry, which includes four new faces. 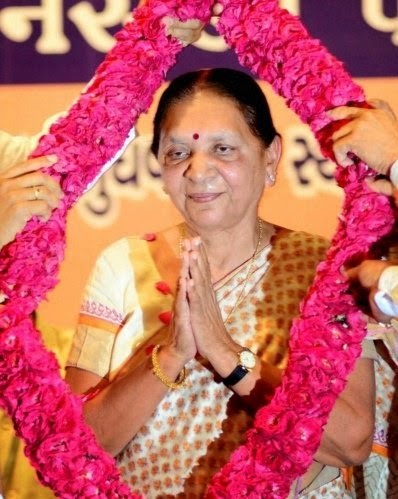 Anandiben Mafatbhai Patel was the Cabinet Minister of Road and Building, Revenue, Urban development and Urban Housing, Disaster Management and Capital Projects in the Government of Gujarat from 2007 to 2014. She has been a key leader in the BJP cadre of Gujarat, alongside former Chief Ministers of GujaratKeshubhai Patel and Narendra Modi. At present, she is one of the longest serving women MLA in Gujarat. She started her political journey as a Member of Rajya Sabha in 1994 and moved to Gujarat during the state elections in 1998. She is currently the only woman MLA of Gujarat to be elected 4 consecutive times. 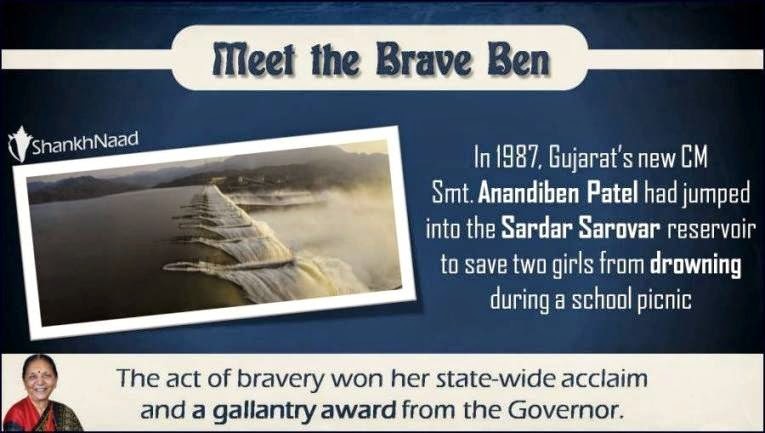 Anandiben Patel's entry into politics began with an accident during school picnic in 1987. Two girl students from her school accidentally tripped over and fell into the river Narmada. In the midst of such a desperate situation, she jumped into the raging river and single handedly saved two drowning girls. She received president's bravery award for this.